In Ethics and the Dynamic Observer Narrator: Reckoning with Past and Present in German Literature, Katra A. Byram proposes a new category—the dynamic observer form—to describe a narrative situation that emerges when stories about others become an avenue to negotiate a narrator’s own identity across past and present. Focusing on German-language fiction from the nineteenth and twentieth centuries, Byram demonstrates how the dynamic observer form highlights historical tensions and explores the nexus of history, identity, narrative, and ethics in the modern moment. 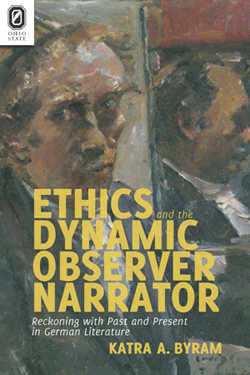 Ethics and the Dynamic Observer Narrator contributes to scholarship on both narrative theory and the historical and cultural context of German and Austrian literary studies. Narrative theory, according to Byram, should understand this form to register complex interactions between history and narrative form. Byram also juxtaposes new readings of works by Textor, Storm, and Raabe from the nineteenth century with analyses of twentieth-century works by Grass, Handke, and Sebald, ultimately reframing our understanding of literary Vergangenheitsbewältigung, or the struggle to come to terms with the past. Overall, Byram shows that neither the problem of reckoning with the past nor the dynamic observer form is unique to Germany’s post-WWII era. Both are products of the dynamics of modern identity, surfacing whenever critical change separates what was from what is. Katra A. Byram is assistant professor in the Department of Germanic Languages and Literatures at The Ohio State University.